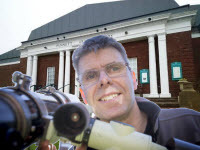 Nice to be back at the museum for a lecture, well at least Mark was; he was giving the lecture to the Whitby Naturalist Society. Mark had been asked some time ago to give a talk about the night sky, and his chosen subject was the diversity of celestial objects astronomers observe. It was slightly odd giving a talk on a Saturday afternoon, however the turnout was far better than Mark was anticipating, 40 plus! Using a power point presentation and the Starry night program, Mark talked for around 50 minutes before fielding a good number of questions, indeed we were in danger of overrunning. Mark hoped everyone had taken something from the presentation, and looked forward to a return some time in the future. Mark thanks Jane Pottas and all at the Naturalist society for their presence and appreciation.